Get ready for Christmas early! It’s never too early to start preparing for the festive season. Whether you’re looking for the perfect gift or a treat for your own home, we have so many beautifully made items that are perfect for the festivities. A really lovely alternative to an advent calendar! Our Wooden Christmas Tree Advent Calendar looks wonderful in the home and makes the count down to Christmas so much fun. You can also personalise the calendar to make it truly special and unique. A real keepsake that can be used every year. A quirky gift idea that is very special. Your recipient can look at their special map location, piece the coasters together to make a larger place-mat or even just use it as coasters. These look fantastic in the home and on the coffee table! Our Map Paperweight is brand new to our website! It would make a very special and unique gift that your recipient can keep forever. Arrives in a lovely gift box. Napery has got to be up their on your Christmas must haves! These Mapkins are a great conversation starter and would look fantastic on the dinner table. A wonderful gift with customised address. Map a special location on the tea towel. Our Map Tea Towels are 100% cotton and make a fantastic present. Why not get your own in time for Christmas as a useful item in the kitchen. A really fun and unique festive present idea. 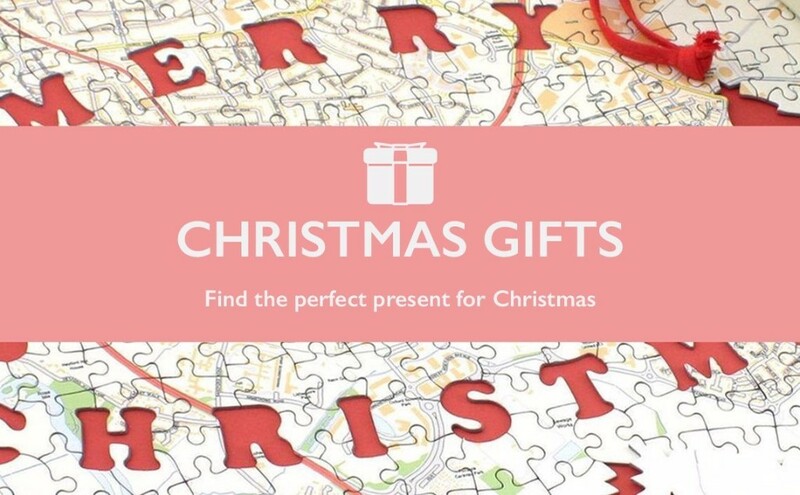 Your recipient will love piecing together their unusual Jigsaw Puzzle, that spells out Merry Christmas within the puzzle and even has special ‘whimsie’ pieces, in shapes of Crackers, a star and a stocking.